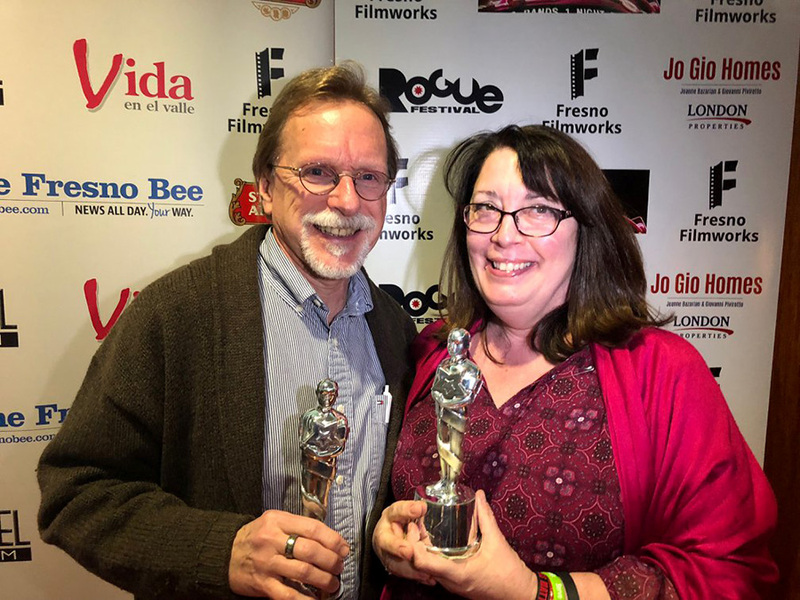 The Academy would like to recognize John Moses and Ruth Jenkins with special Oscars for supporting Fresno Filmworks from its earliest beginnings. Where are you both from, and what do you do professionally here in Fresno? John: Ruth and I moved to Fresno 30 years ago from Long Island, New York. She is originally from Oregon, Ohio; I’m from Reading, Pennsylvania. Ruth is a Professor of English at Fresno State, specializing in Victorian studies and critical theory, and she is the author of two books and numerous articles on those areas. I am head of the Film Studies Program at Fresno City College. Ruth: Gardening has long been a passion when time has allowed. I am slowly transforming our back yard into a bird and butterfly sanctuary. I also enjoy working with fiber and fabric—quilting for years and currently learning to make Victorian bobbin lace. John: I enjoy reading poetry and literature, mostly modernist writers like Wallace Stevens and Virginia Woolf; for pure pleasure reading, the draw is crime fiction, like the works of Raymond Chandler and Dorothy B. Hughes. A greater avocation, though, is photography, which occupies most of my free time, shooting, editing, and framing. I’ve won a couple of awards and have had my work exhibited locally at the Spectrum Art Gallery and City Hall as well as other galleries in California and Oregon. How did you first get involved with Filmworks? John: I became involved with Filmworks in 2001 when a group of local cinephiles began meeting to expand the cinematic experience in Fresno, which led to the first screenings in 2002 at the Fresno Art Museum and The Tower Theatre; I then served as founding president of the board for 7 years and program director for 13. Ruth: Through John, I’ve been connected to Filmworks from its inception. My vantage point has given me a tremendous appreciation for all of the work of the Filmworks board—time and effort that far exceeds what might be imagined. Securing and maintaining venues, sponsors, and nonprofit status. Selecting films, followed by extensive calls to distributors—establishing relationships, convincing them that Fresno would draw an audience, anticipating multiplex offerings. Now that a new generation of board members have taken on Filmworks, I actually get to view the films with John, which I enjoy. How do you support Filmworks now and why? John: We support Filmworks with an annual membership donation in its lead-up to the Fresno Film Festival, knowing how important that kind of support is to help cover the expenses of the three-day event. After I left the Filmworks’ board in 2016, its members graciously honored me with the title President Emeritus, so on occasion I’m asked for advice on programming, distributor relations, and the like. John: As a kid I was an avid reader, but I was even more passionate about going to the movies, whether being taken by my parents to a roadshow screening in Philadelphia for “Ben-Hur” in 1959 or dropped off for matinees at one of the three grand movie palaces in downtown Reading—all of them long gone to make way for urban redevelopment. Then during my undergraduate years, my interest and understanding deepened: in the late 1960s and early 1970s nearly every college had a film society that screened classics from the 1920s and ’30s as well as contemporary masterpieces from Bergman, Fellini, and Kurosawa. Ruth: As a child, my access to movies was largely the result of staying up late and watching older films with my mother and sister like “Meet Me in St. Louis,” “Holiday Inn,” or “Lost Horizon.” It really wasn’t until graduate school that I got the opportunity to see a wider range of contemporary films. John and I would often go to The Movies, a revival house in Cincinnati, where I could see films that would transport my mind and imagination, and we were regulars at the New Community Cinema in Huntington when we lived in New York, which further kindled that experience. What other films do you enjoy? John: What first comes to mind are those classic and current motion pictures that can still be enjoyed in 35mm or 70mm screenings. That often takes us to the Castro Theatre for the San Francisco Silent Film Festival and the Noir City Festival. But I’ve also been to the Paramount Theatre in Oakland for Abel Gance’s “Napoleon,” Hollywood Theatre in Portland for “Casablanca,” and the Esquire IMAX in Sacramento for “Dunkirk.” The Egyptian Theatre in Hollywood is another gorgeous venue for seeing movies in their historic format. John: I’d repeat what I’ve said since 2002: If you love independent cinema and diverse movie choices for the Central Valley, then you need to support Fresno Filmworks with your time and money. Don’t just complain about the narrow programming at the local multiplex chains. Take a seat at the historic Tower Theatre every second Friday of the month! Our “I Heart Film” series spotlights our generous community donors. Contact our development director, Cassandra McGuire, for information on becoming a sponsor or member.